Hello there! I have two Graphtec CE6000-60 cutters and the weirdest thing is happening. I am trying to mirror an object but the cut is coming out thinner than the original. This happens both in Cutting Master 4 and VinylMaster. I even tried mirroring using Illustrator and the cut still came out thinner than the original. I'm honestly so confused why this is occurring. The objects are identical in every way. I have attached the object file for reference and a picture of the cut that I am getting. The left is the original and the right is mirrored. Thanks for the reply MZ SKEETER. In between the time that I posted this and your reply I have been debugging the issue. It appears that neither of my cutters are actually cutting good lines at all. In the photo I attached to this reply you can see that the hexagon has uneven widths on every side. I have been using these graphtec cutters for bigger designs so I didn't realize the problem until now. Any ideas? I can see it. How fast are you cutting? What is the blade offset at? It is probably a setting, if both cutters are doing it..
Are those cutters CE6000-60 Plus? I can see it. How fast are you cutting? What is the blade offset at? Cutting at 5 cm/s with a force of 10 for Oracal 651. Blade is at a depth where it only slightly nicks the backing paper. Blade offset is at 0. I have tried slowing down to the lowest (1 cm/s) but same results. 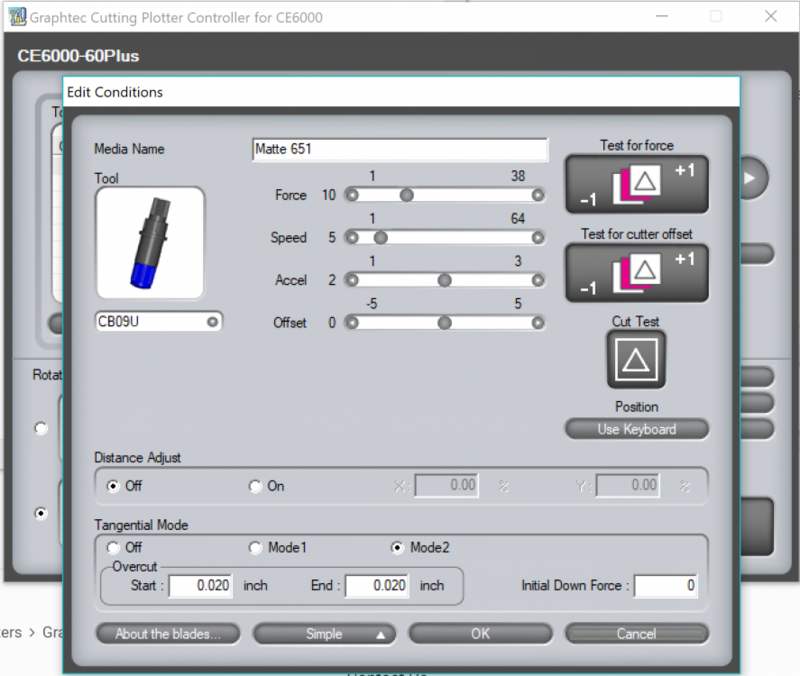 Trying to help you with better software... Are those cutters regular CE6000-60 or CE6000-60 Plus? too bad. You could have gotten the GraphtecProStudio free but it is not for the Plus models. Where are your pinch rollers located, it looks like something slipping. Show some pics of the whole front of your cutter, with the pinch rollers. the right pinch roller doesn't even look like it is on the grit roller, why not move the vinyl further to the right, and use the 2nd and the big grit roller? If I set the offset angle to 0 I get perfect, clean cuts and straight lines but the cutter is VERY slow and makes lots of micromovements. If I leave it at an angle of 30 it goes quickly but doesnt cut straight lines. Any ideas? You have never shown all of your settings, so I don't know what you are doing. Obviously 0 is wrong. I never change any settings other than speed and force and I do it right from my Graphtec Cutting Controller. Been like that for 10 years. 30 degree Angle offset is factory default setting. I never make changes directly on my vinyl cutter. If your making changes in your cutting software, is it the same on your vinyl cutter menu? Have you tried to set your cutter back to factory default settings? I will try the factory reset. What program do you use to set the conditions on your cutter? I have cutting master 4 and the illustrator plugin. Graphtec Cutting Controller. It is on the Graphtec site for your model. It is controlled right from your computer. The cutter has to be set ready to cut, before you can open it up on your computer. The cuts look horrible like the blade tip is not even there. Have you looked at the blade tip? Have you tried a new blade and what degree blade are you using? The cuts should be smooth, you only cut with the very tip of the blade. You should just barely see and feel the blade tip out of the blade holder. Have you looked inside the blade holder to make sure there are no tiny vinyl scraps and that the blade turns freely? A drop or 2 of light oil in the blade holder. Have you tried switching the blade holders? My Cutting controller is set for Tangential Mode is set at Mode 1. You have that one on Mode 2. Change the overcut start and end to 0.01 What does the TEST cut look like when you press TEST CUT on the Graphtec Cutting Controller? I hope you changed that Offset angle back to 30 degrees. Show the test cuts of the square with a triangle in it. What has Graphtec tech support told you? Seeing as how you are using Cutting Master. do you have the Command on GP-GL as it must be. I cannot speak to the settings on your machine, since mine pretty much worked right out of the box (knock on wood). As to your 'micro movements' - check the nodes of the graphic. you might have tons. For every node, that's another (pseudo stopping) point, and set of instructions for the cutter. There are a lot of graphics that I end up cleaning up so that I can get it to cut more efficiently and cut down on instruction points. It makes for a smoother cut and less movements on the cutter carriage. There are times where I can delete about 60%-70% of the nodes and still maintain the design. It's a pain, but if I have to cut a bunch of the same design, it makes it worth my time. These are relatively small cuts (about 0.5 inches per object). I have checked out the blade and blade holder and even switched with my other graphtec cutter to make sure that wasn't it. Only the very tip of the blade is out and barely marks the paper backing of the 651 vinyl. No vinyl scraps in the holder and the blade rotates freely. Tangential Mode 1 lifts up and touches down a lot, so I've always had it on Mode 2. I change the overcut to 0.01 and have attached an image of the TEST cut (left is Mode 1 right is Mode 2). Offset angle has been back to 30 degrees for awhile. Graphtec Support is currently closed so no luck on that. Will try again in a few hours. Command has been at GP-GL since factory reset. Good point on the nodes, but these graphics have very few. The rectangles only have 4 nodes (1 per corner). For the other objects I use the Illustrator node smoothing tool a lot which brings the number way down.